FreeConference.com Spring Sale is almost over - 20% OFF for a limited time! The 20% OFF Spring Sale is Almost Over! Spring will be over soon… and the 20% Off Spring Sale will be over even sooner! But don’t fret! You have until May 31st to Make Your Meetings Better! Your free account comes with 15+ international numbers, but it doesn’t have to stop there! Upgrading to one of our paid plans give you access to additional dial-ins for over 30 more countries, making it that much easier to connect with your team internationally. Toll-free dial-ins are a great way to encourage participation while keeping costs to your participants to a minimum. 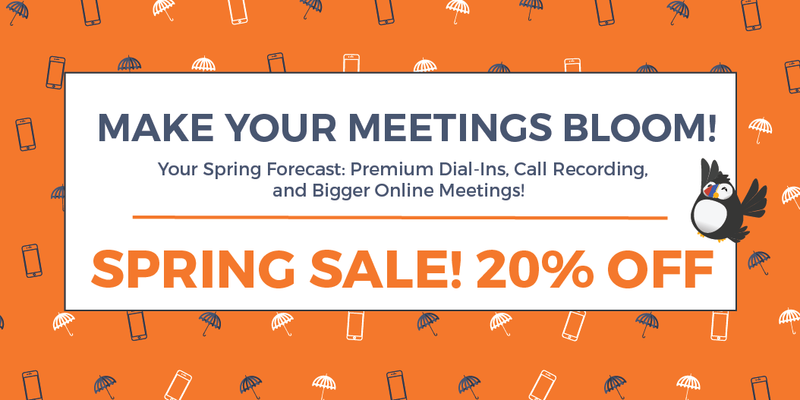 Give your participants a toll-free dial-in number with the FreeConference.com Spring Sale, and they will be able to dial into your conference for free, no matter where they are! PLUS: All toll-free and premium international conference call numbers from FreeConference.com come with Brand-Free Greetings, which means the voice prompts that you hear while dialing will not mention “FreeConference.com”, or any references to the brand. For lengthy or important meetings that require detailed information capture and a crystal-clear understanding of delegation and timelines, nothing beats a recording of your meeting. Conference Call Recording from FreeConference.com not only records the complete audio of your meeting, but it also creates an MP3 file that can be shared. The Plus Plan increases your online meeting room size from 10 participants with 3 simultaneous live feeds to 20 participants with 5 simultaneous live feeds, meaning you can get your whole team together for your meeting, webinar, or presentation. Expecting a bigger crowd? Your online meeting room is always ready, and can hold 400 audio-only callers at any time. *Toll-Free & Premium International minutes included with all plans are allocated on a monthly basis and accumulated at a rate of per minute/per caller.